MONTEREY, California -- For the third time since 2004, the Monterey Bay Aquarium has placed a young white shark on public exhibit, bringing him to Monterey on Tuesday evening (August 28) – 24 days after the shark was caught accidentally in commercial fishing gear off Southern California . As with the two prior animals – white sharks that were kept at the aquarium for 198 days (in 2004-05) and for 137 days (in 2006-07) before they were returned to the wild – the aquarium hopes to keep him on exhibit for several months as a way to change public attitudes and promote greater protection for these magnificent and much-maligned ocean predators. The young shark, a 4-foot, 9-inch male weighing 67 � pounds, was brought north Tuesday in a 3,000-gallon mobile life support transport truck. Caught three miles off Ventura by a sea bass fisherman, he had been held since August 4 in a 4-million-gallon ocean pen off Malibu . He was feeding and navigating the waters of the pen before he was brought to Monterey . Through its White Shark Research Project, the aquarium has worked since 2002 to learn more about white sharks in the wild and to bring a white shark to Monterey for exhibit. During that time, aquarium staff have tagged and tracked 10 juvenile white sharks off Southern California – animals they either collected or that were obtained from commercial fishing crews who caught them accidentally. Both sharks kept at the aquarium were tagged and tracked after their release. The first shark, a female brought to the aquarium in September 2004, was “the most powerful emissary for ocean conservation in our history,” said aquarium Executive Director Julie Packard. The shark was part of the aquarium’s Outer Bay exhibit for six and a half months and was seen by more than a million people between September 15, 2004 and March 30, 2005. In follow-up surveys, many visitors reported coming away with a deeper appreciation of the need to protect white sharks and their ocean homes. More than 600,000 people saw the second white shark between September 1, 2006 and January 16, 2007, when he was returned to the wild. The nonprofit aquarium has contributed more than $1 million since 2002 to field studies of juvenile and adult white sharks, in addition to its efforts to exhibit white sharks. In the fall of 2006 alone, scientists with the Tagging of Pacific Predators (TOPP), supported in part by the aquarium, placed 41 electronic tags on adult white sharks off the Farallon Islands and Point A�o Nuevo. TOPP researchers have now tagged 101 adult white sharks off the Central Coast . The recently published tagging studies are demonstrating that adult white sharks show a high degree of fidelity to the region. Genetic studies on DNA samples taken from the sharks when they’re tagged are also underway, and will help to discern the connections between Central Coast sharks and other white sharks in the western Pacific and Atlantic oceans. Data from the tags are offering new insights into the far-ranging travels of white sharks in the eastern Pacific, according to Dr. Barbara Block of Stanford University , a marine biologist and principal investigator with TOPP. Tag data and published research can be found at www.topp.org. Aside from the two animals that thrived during their stays in Monterey , no aquarium in the world has exhibited a white shark for more than 16 days. In the Monterey Bay Aquarium project, collecting white sharks has been the subject of a focused multi-year effort involving aquarium staff, scientists and fishermen, said aquarium husbandry curator Christina Slager . This approach, developed in consultation with a panel of independent shark experts, is designed to minimize the stresses of collection, holding and transport, she said. Before bringing a white shark to Monterey, members of the aquarium’s field team monitor its behavior to see if it has adjusted to swimming in an enclosed space. The team offers salmon, mackerel and other fish, and confirms that the shark is feeding before an attempt is made to bring it to Monterey . The aquarium’s 1.2-million-gallon Outer Bay exhibit was designed for pelagic (open ocean) animals like white sharks. It is home to Galapagos and scalloped hammerhead sharks, as well as large bluefin and yellowfin tuna, barracuda, sea turtles, ocean sunfish and other species. With the first two white sharks, visitors saw the animals face-to-face, and learned about shark conservation issues in conversations with staff and volunteer guides; through an auditorium program devoted to the white shark project; and through exhibit graphics that specifically address the threats facing white sharks. Similar programs are in place for the new arrival. Web visitors can see the shark online via the aquarium’s streaming Outer Bay web cam from 7 a.m. to 7 p.m. daily (Pacific time), at www.montereybayaquarium.org. (Specific link: http://www.mbayaq.org/efc/efchp/hpobw_cam.asp). White sharks are in decline worldwide, in part because they’re slow to reproduce and because of growing fishing pressure that is decimating all shark species. Their fearsome reputation has also made them a target of trophy hunters and the curio trade. 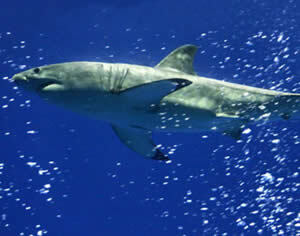 White sharks are protected in California and other U.S. waters, as well as in South Africa , Australia , Mexico and several other nations. In October 2004, white sharks were granted additional protection by the 166 nations that are parties to the Convention on International Trade in Endangered Species of Flora and Fauna (CITES).